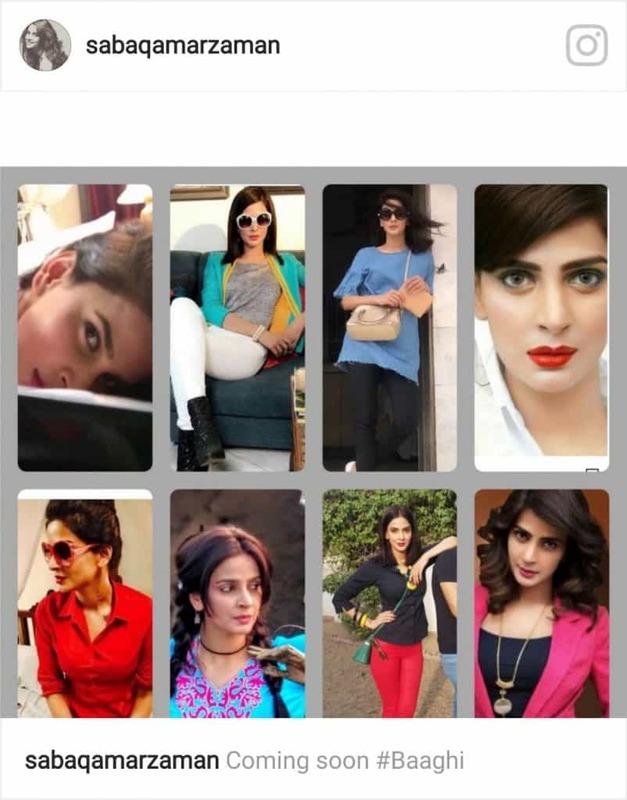 One of the most gorgeous girls of our television screens, Saba Qamar is returning to drama industry after a short break. The heartthrob girl, Saba Qamar presently needs no introduction. By her countless out-standing performances on TV and film industry, she has marked herself among the most talented Pakistani actresses of today. She was last seen on television in a drama serial ‘Besharam’, premiered on ARY digital in May 2016. She then took some time off from television and routed herself towards the big screen. She appeared in a Pakistani movie ‘Lahore Sey Aagay’ and got appreciations from the critics for her performance. She also got nominated in the category of “Best Actress” in “Lux style awards” for her performance. She was later seen in a Pakistani movie ‘8969’. After proving herself in Pakistani cinema she then appeared in an Indian movie named ‘Hindi Medium’. She was in one of the lead roles of the movie and was highly acclaimed for her remarkable performance. She did not only receive appreciation from the fans all around the world but was also acknowledged by some famous Indian actors and actresses. Rishi Kapoor and Vidya Balan to name a few on the list. Her outstanding performance in “Hindi Medium” has made her an international star. After a break of almost one year from television, she would be returning to our screens in a drama serial ‘Baaghi’, which would soon broadcast on Urdu 1. Saba would be playing Qandeel Baloch, a social media celebrity and a controversial personality who lost her life to honor killing. The teasers of the play is already out and Saba once again is found doing justice with the role. To play and perform provocative stories can never be a piece of cake. Irrespective of the fact that how big an actor you are, you need to pour in tremendous efforts and show courage to perform such character. No doubt, Saba is one brave artist who can pick one and adapt to it righteously. The promos of the drama serial already explain how Saba is once again committed to her role in ‘Baaghi’. This is not the first time that Saba is performing a bold character. She is one confident actress who has given some daring performances on television in past. She has played a role of a victim of sexual abuse in drama serial ‘Paani jaisa pyaar’ and ‘Sangat’. She has played a glamorous role of an actress in drama serial “Besharam”. She has also seen performing a character of prostitute in ‘Shehryar Shehzadi’ These dramas on social issues with bold and challenging characters were difficult to perform but Saba has portrayed them very beautifully. Saba is a versatile actress who has performed variety of characters on television. She has been seen performing a character of a middle class overambitious girl in ‘Maat’. She has also performed a character of a poor yet independent and out spoken girl in ‘Mein Chand Si’. In her drama serial ‘Bunty I love you’ she has gracefully performed the character of a rich women. On the contrary, she has also carried the character of a village women in its true essence in ‘Ullo Baraye Farokhat Nahi’. These are few of her performances to mention, which converse that Saba is versatile and always different. Now once again, she is in to the lime light of television by taking up a unique character in ‘Baaghi’. The comeback of Saba Qamar to television screen after about a year is overwhelming for all the fans around the country. Saba, being a significant name in the industry has got potential to attract the audience and can make them wait for her upcoming project. Thus, we greatly admire her forthcoming appearance in a drama serial and we just can’t wait to watch the queen of our drama industry on television screen again. 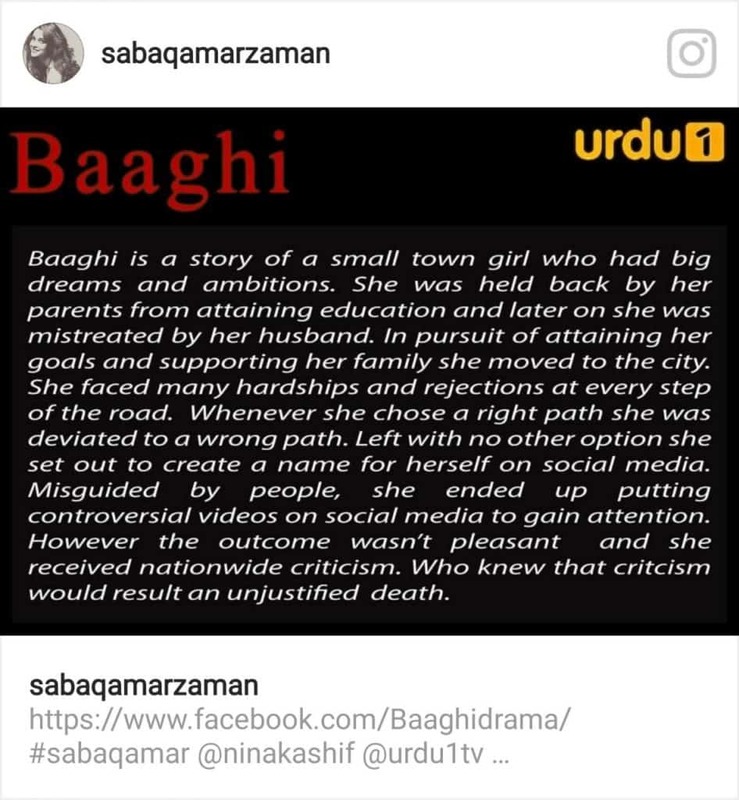 However, with ‘Baaghi’, we also look forward to watch how the team has portrayed the social issues of our society upfront.